If you already treat your chickens with extra little fruits and vegetables here and there, you may find yourself getting bored of giving your chickens the same old things. Finding new treats for your chickens can be rewarding for both you and your chickens, and it is always tempting to look farther afield for interesting food to give to your chickens. As one of the more adventurous fruits you can feed to your chickens bananas represent an option that is certainly different from other things that you would expect your chickens to eat. But does this mean that bananas are bad for your chickens? Not necessarily. If they are prepared correctly, a subject that I will come to later, bananas can be a nutrient rich treat for your chickens. Bananas contain high levels of potassium and other nutrients meaning that if you feed even a small amount to your chickens, they will get all the nutrients that they need. The reverse of this is that while bananas can be rich in things that are good for your chickens, feeding chickens bananas can also be dangerous. The reason for this is that as well as containing a lot of potassium, and vitamins bananas also have quite a ﻿﻿high﻿﻿ sugar conten﻿﻿t﻿﻿. While the high sugar content of a banana won't affect most humans, too much sugar can be bad for chickens as they are not capable of digesting large quantities of sugar.Another dietary need that bananas do not meet is a mostly dry diet. Because chickens are also not capable of processing wet foods you could find that your chickens do not get any of the health benefits of a banana and instead could even end up being harmed by over consumption of the fruit. One way to avoid this is to make sure that you feed your chickens as small portions of bananas as possible, unfortunately, this somewhat eliminates the point of treating your chickens. 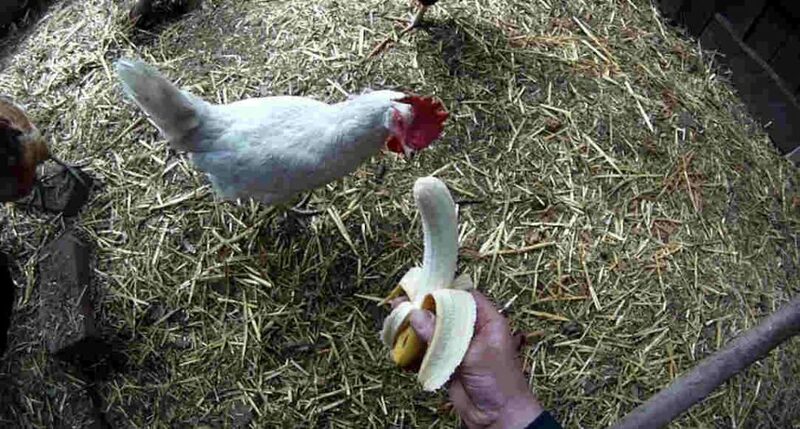 If you are not able to feed your chickens that much banana you could end up wasting a lot of food. Moreover, it is inadvisable to feed your chickens banana peels as firstly, most chickens will not try to eat them, and secondly, they occasionally can contain harmful substances used to prevent pests. All this leads to lots of time consumed and waste when feeding your chickens bananas. If you really insist on feeding your chickens bananas, you can. Ideally, you could feed them a dried portion in very small quantities, and this would be fine for your chickens. See full list of foods that you should and shouldn't feed you chickens: What can chicken eat? What can’t chicken eat? Don't forget to share your thoughts on this with us. There is a sight that states that bananas ( and their peels) are dangerous. Thank you for your answer. I have found that mine do not seem to eat anything in the broccoli family… perhaps I should try again.